Cardiac arrest is a major global problem. In Europe, about 350,000 people each year have an out-of-hospital cardiac arrest, and in the US, that number is 380,000. Sadly, fewer than 10% of those people will survive. Yet, if someone starts CPR (cardiopulmonary resuscitation) before an ambulance arrives, they can double a person's chances of survival. In addition, if an automated external defibrillator (AED) is used, this can further improve the person's chances. Teaching lay people CPR and how to use an AED has the potential to save numerous lives. That's the idea behind the Lifesaver app. 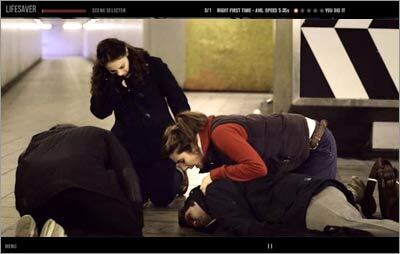 Lifesaver is a crisis simulator that fuses interactivity and live-action film to teach CPR in a new way on a computer, smartphone or tablet. For example, when "Jake" collapses from a heart attack, you are questioned about what to do at each step – with a clock running to represent the need to respond quickly to prevent brain damage or death. When it comes time to administer CPR, you're prompted to swipe your tablet or phone up and down in the air in the speed of the chest compressions. You can see and hear the patient's chest moving and the effort needed to do the compressions as the app tells you if you're going too fast or too slow. The app includes three realistic and interactive scenarios, two covering cardiac arrest and a third choking. Each scenario takes about 10 minutes. In addition there are some easy-to-follow flow charts of the current guidelines and common questions. Users can also post their scores from the scenarios on Twitter, Facebook and other social media. 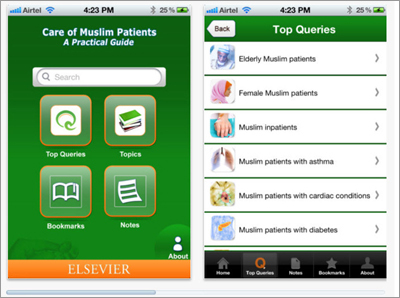 The app and website are free to use. Since its launch in May, Lifesaver has had over 160,000 web users and more than 10,000 downloads, and surveys have shown that users feel much more confident that they would start CPR if the need arose. The app has also won various awards, including four golds and a silver award at the UK national E-Learning Awards. In addition, it was just nominated for a BAFTA British Academy Award 2013 in the Children's Interactive category. 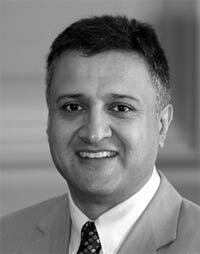 Dr. Jasmeet Soar (@jas_soar) is a Consultant in Anaesthetics & Intensive Care Medicine for the North Bristol NHS Trust in the UK. 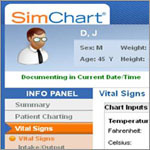 In his previous role as Chairman of the Resuscitation Council (UK), he worked with the digital media company Unit 9 to develop the Lifesaver app. Dr. 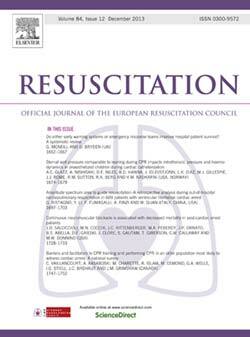 Soar was interviewed by Aisling Murphy, Publisher for Resuscitation at Elsevier. Lifesaver is aimed at the large majority of people who have no CPR training. Lifesaver guides users in the simple but vital steps of performing CPR to encourage them to step-in if they witness someone having a cardiac arrest and, potentially, help save a life. The interactive video format of Lifesaver is a game changer for how people learn CPR. The vivid reality of the scenarios is compelling and encourages people to learn CPR and help save lives. What gave you the idea to develop Lifesaver, and how did you get involved with the development? I was approached in March 2012 by Martin Percy, an interactive film director working for Unit 9, a digital media company. He wanted to create a realistic live-action movie that you play like a game that throws you into the heart of the action and recreates the emotions and sense of thrill of saving a live. The film would also show the consequences of not doing things right, and the opportunity to go back and start again. We both felt that learning CPR using an inanimate manikin, although useful, did not create a realistic training situation. I was Chairman of the Resuscitation Council (UK) at the time, and with colleagues immediately recognized this as something innovative we wanted to support. The first challenge was raising funding; we were fortunate to secure competitive grants from the UK Technology Strategy Board and the Resuscitation Council (UK). It took just over a year from the first discussions to its launch in May 2013 on the web, iTunes and Google Play. What was involved in developing Lifesaver? My colleague Dr. Andrew Lockey and I worked closely with Martin Percy and the Unit 9 team to create storyboards for three interactive scenarios, the first of which is Jake who has a cardiac arrest whilst out walking with friends. Filming took place over three days in November 2012, once factually accurate storyboards were completed, and actors auditioned. This was the most fascinating aspect of the development as I had never been on a film shoot before. We had a film crew of about 40 people, and my job was to ensure the scenarios were as realistic as possible and that the CPR and teaching steps were done properly and captured on the film. Three long days at three different locations with multiple retakes was rewarded by some great footage. Once the scenarios were edited, and the computer whizzes at Unit9 added interaction, we had a period of testing. One challenge was making Lifesaver work across all platforms, and this required a large amount of testing. The technology aspects are beyond my comprehension, but I'm pleased to say it all works as planned. You refer to Lifesaver as a "game changer for how people learn CPR." What is unique about this app? The award citations stated that we had raised the standard for e-learning. Even though I am biased, most e-learning is still based on a slide show format. Indeed I find most e-learning modules frustrating as the designers usually set awkward mandatory questions as a forcing measure to make users look at the content in order to complete modules. The interaction we have used in Lifesaver avoids this and provides real time feedback to help improve performance. The main aim of Lifesaver was to help save lives. It is still early days in the project, and I have no doubt that at some stage if it has not happened already, someone will spend 10 to 15 minutes on Lifesaver and go on to help save a life with what they have learned. Even one life saved will make the project worthwhile. That's why I am passionate about resuscitation, my work with the Resuscitation journal, and why I want everyone to learn CPR. Lifesaver will help achieve this goal. Estoy gratamente sorprendido ,por su trabajo,el cual denota la responsabilidad y el respeto que tiene para enseñar a personas como uno mismo a salvar vidas .I am sorry ,but I can not write very well y english.I like to much this work of all of you, thanks.